HDInstTool is a Harddisk Installation Tool. 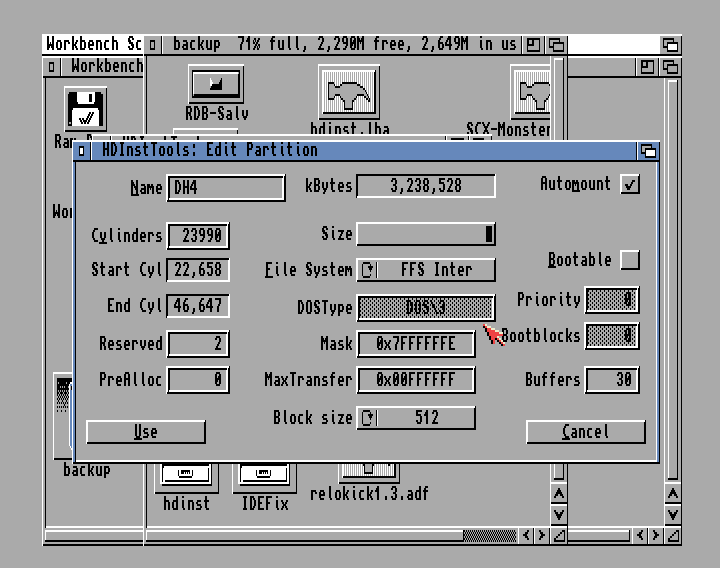 This is a great alternative to Commodore's original HDToolkit partitioning software.� InstTool is much easier to use that HDToolkit and it recognises larger HDs, reporting total HD space and partition sizes correctly, making it safer to use larger HDs over 4GB with your Amiga (as long as you use a supporting file system).� It has built in facilities to handle third party file systems and can also format partititons and copy HD backups onto a newly formatted disk. Having used HDToolkit for many years I was used to its slightly eccentric way of working. Many settings and features were never logically laid out or obvious and for larger HDs (over 4GB) it never reports the correct partition or total HD sizes. Using HDInstTool is the complete opposite. It has a nicely laid out interface, and each part is very easy to use. The partitioning screen for example is much easier than HDToolKit's to use and with larger HDs it actually supports and reports the correct partition and total HDD sizes. 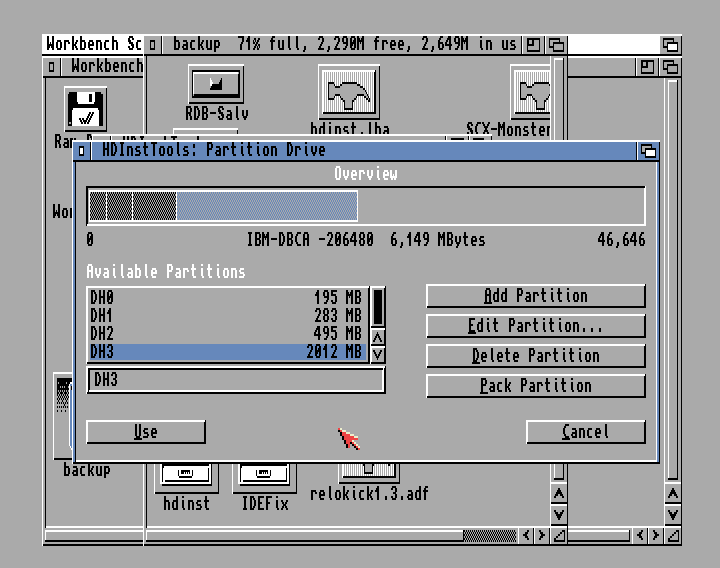 The only negative thing I will say about partitioning is the adjusting of partition sizes. I couldn't find a way to manually type in an exact partition size, and had to instead use a slider to select the size. This slider isn't that accurate and jumps a few 100MB per increment. But it is a small issue and nothing to deter the use of this utility. It also has direct support for most of the available third party file systems such as SFF so is good to use if you are planning on setting up a large HDD 4GB+. In addition to setting up and partitioning an HD this program also allows you to format the partitions once they have been created. This is a useful feature as it speeds it up compared to having to format via Workbench or the Shell. It also has a copy feature to allow you to copy the contents of another HD onto your newly partitioned drive. If you need to setup and partition a drive I recommend you give this a try. Good Points Very easy to use. The interface is intuitive and unlike HDToolkit is easy to navigate and control. Bad Points As with any HDD partitioning software, it is not straight forward for complete beginners. But the documentation is first class and will allow anyone to use the software.